Many places in the Turkish Mediterranean coast have become famous for that combination of green mountains with blue sea in an endless succession of bays, peninsulas and islands. 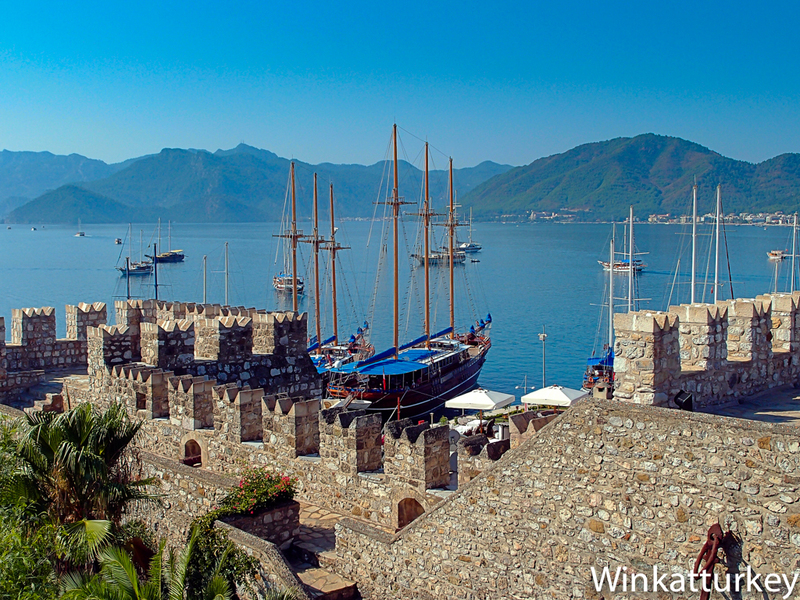 Marmaris is one of the most visited locations that coast. Situated in a virtually closed bay, Marmaris offers sandy beaches, water sports, boat trips, walks through the old town, shopping, sightseeing and nightlife barely leaving our accommodation. Top it off, It is ideally located for visiting other places as Kiddle Datça or on day trips. But if something hits Marmaris is the landscape that forms the bay itself, one of the places not to be missed in southern Turkey. The history of Marmaris is as old as that found elsewhere in Anatolia and no news of the existence of a castle there since 3000 AC. After the Persians, Alexander the Great and later became Roman. From neighboring Knids, at the end of the Datça Peninsula, St. Paul departed prisoner to Rome on his last trip. As in the rest of the southern coast of Anatolia, the Middle Ages was very hectic in the square, with the Byzantines, Arab, Turkish pirates and disputing the sovereignty of Physkos, the Greek name for Marmaris. The city was also under the influence of the Knights of St. John in Rhodes whose capital is located directly across the bay. Finally, Suleiman the Magnificent used it as a base to embark his army and conquer Rhodes. During the preparation of this campaign, the great Sultan sent completely rebuild the castle has remained in good condition until today. In Marmaris there are several marinas where numerous yachts and refuge, It is also place for your cruise en route for this area. From Port numerous day trips are offered to explore the bay and the southern coast of the peninsula of Datça. They are a great experience where we meet and places where beaches can only be reached by sea. The rest of the expense of the people form a very long beach with a boardwalk kilometer where the majority of hotels and nightlife venues. The old town also has great appeal, its narrow streets and whitewashed houses reveal membership in that Mediterranean culture so familiar to us that the Spaniards. Throughout our walk we find beautiful places, shops and places to sit. In some houses have enabled the terraces and upper floors for use as cafes or restaurants with fabulous views. In the highest part of the town is the castle of Suleyman the Magnificent. From its privileged location you can see the whole bay and surrounding area. The castle has been completely restored and we can visit for the most part, and walk around their yards, towers and walls. As noted on other occasions hays, whether we should be careful with children because some areas are not too protected, otherwise it is a highly recommended visit. Castle schedules change seasonally and visitors should check in at our hotel before going to avoid meeting closed. In the village we also find a lively bazaar with the usual craft stalls, fakes, ons, etc.. A good opportunity to demonstrate our skills in bargaining. The village tour can end at any of the restaurants and stay in the bars nearby port. Other possibilities for our stay in Marmaris is to take a ferry to Rhodes. In few 50 minutes may be visiting an amazing medieval city with its palaces and walls. There are different times and depending on the time of year you can come and go on the same day. Thus, less than four hours by car or boat Marmaris have the remains of three of the Seven Wonders of the World: the Colossus of Rhodes, Mausoleum of Halicarnassus (in Bodrum) and the Temple of Artemis at Ephesus. The weather in Marmaris is very hot in summer but also in winter rain, especially from November. The months of May, September and October tend to offer a mild climate with little rain, from September though there may be storms. See map of the Mediterranean coast.